Brazil, one of the biggest coffee producer of the world. It offers a medium-bodied coffee, with a sweet touch and a powerful fragrance. Its proportionate characteristics give this coffee a round perfect taste in cup. 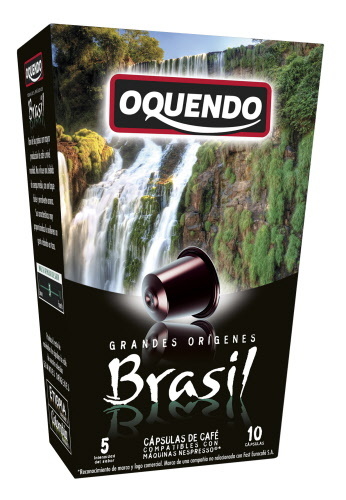 Oquendo capsules are NOT packed in a foil pouch, and can be used directly from the box, and placed in your Nespresso machine. Oquendo capsules allows the blending in the inside, just as it does in a regular espresso machine on a coffeeshop, so the result is a perfect espresso with aroma, taste and crema. Each capsules has 5 grams of coffee in them, unlike most other manufactures that only have 4 or 4.5grams. Each box contains 10 x 6-gram capsules.